So, yeah, my package arrived yesterday with the jelly bag and the Clearjel. After spending some time outdoors this afternoon in the unseasonably warm weather (80 degrees? In Massachusetts? In late October?) I got cracking on that pie filling. This time I a ctually spent a few minutes making a lemon juice and water bath for the slices so they wouldn't brown. 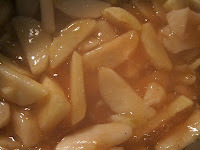 Then the recipe (Ball Complete Book of Home Preserving, Apple Pie Filling) calls for the apple slices to be blanched. I dug an item out of my cupboard I've had for well over 15 years but never knew what it was for. 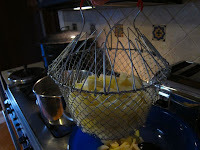 Just recently I discovered it was for blanching foods. Huh! I used to use it to hang fruit to keep it off the countertop. Live and learn. Anyway, I blanched the apples and then got to work on the Clearjel stuff. Working with Clearjel is like working with powdered chalk. It's impossible to measure. (Maybe that is because I don't use a spoon to put things in the measuring cups, but I digress.) After I got everything measured I started cooking the starch, sugar and liquid. Sometimes in the past, when a jam has come precariously close to the edge of the pot and threatened to burn me, we joke about it being like napalm. Never again. Clearjel-enhanced pie filling is the real deal. If this were to spatter onto your flesh while boiling, and you were to rush to the sink to wash it off, nothing would happen. You would have to scrape it off your body with a spatula. And even then you might have trouble with it. Fortunately, this did not happen to me. But I worried about it. A lot. In the end, I made 7 pints of apple pie filling. It is refreshing when the recipe makes the amount the authors think it should make. And it's tasty! The other news is that the pins in my finger came out yesterday. While I'm a little sad that I will be going back to working full time, I am looking forward to seeing patients next week and getting the mobility back in my finger. It's really stiff. But it's already improved since yesterday and I can type with all 10 fingers again. I'll take what I can get. Mmmm, pie. So sorry I can't sample this. Oh, but you can! Next time you visit? I also use the cleargel for gravy. It's awesome, you just want to dissolve it in a little bit of cold water before you add it to your hot juices :)Even makes a beautiful thick, clear turkey gravy without changing flavor.